Oh, Great Pumpkin, where are you? 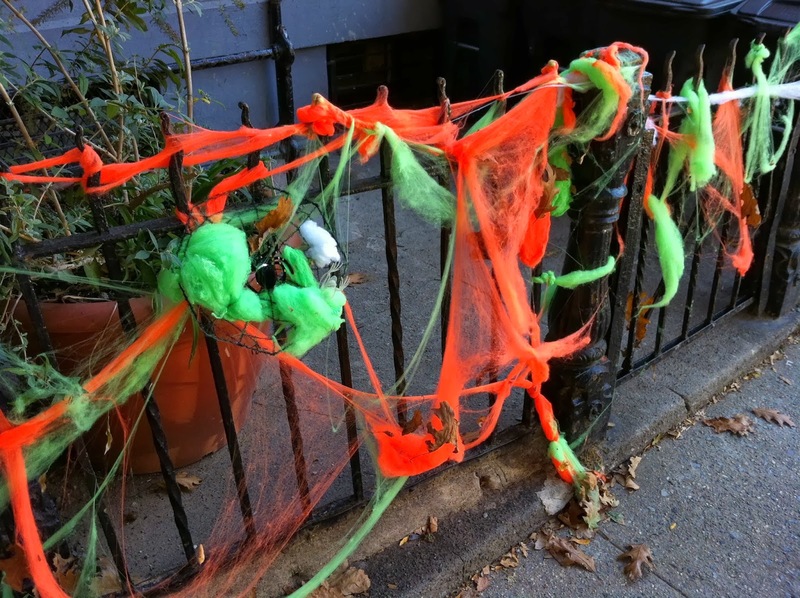 It is almost Halloween, my favorite holiday, and I was initially inspired to blog about my disappointment in the way that certain neighbors are improperly using spiderweb decorations around my neighborhood in Park Slope. I took a walk around this week to observe and shoot photos. I’m here to offer constructive criticism as well as kudos for what I discovered. So, let’s start off with those spiderwebs. 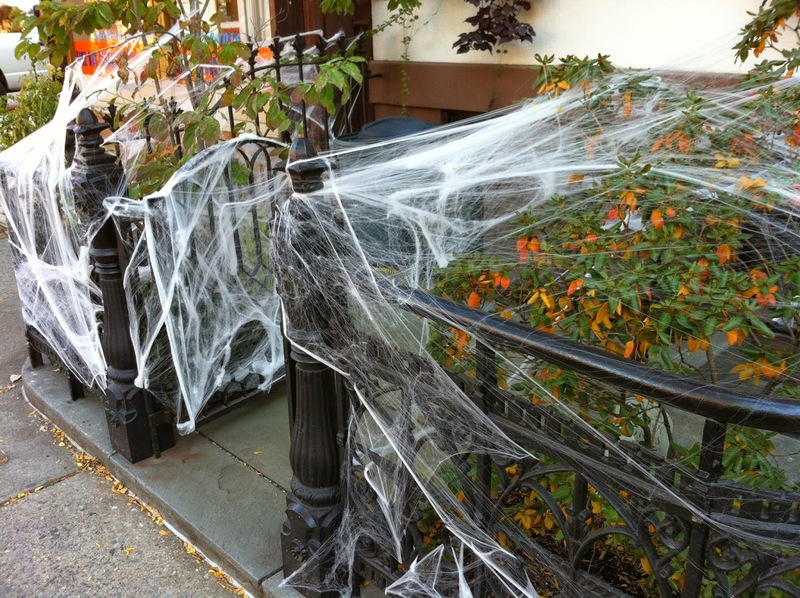 Most people seem to think that the synthetic spiderweb is the easiest way to create that “Halloweeny look” to the outside of their homes. When applied correctly, this is very true, as long as you don’t mind some stray leaves stuck in them. The problem is that most people don’t know how to use them. Since I’m really into Halloween I learned how to work with this stuff when I began helping my mom decorate our home when I was in middle school, so by now I know what I’m doing. 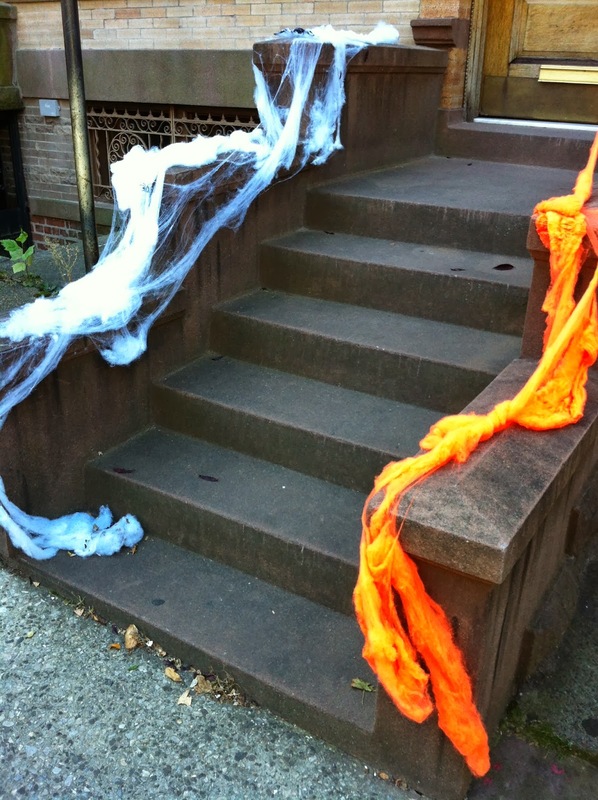 Above is a good example of “You Don’t Have to Use the Whole Bag.” Just because you buy a bag of “spiderwebs” for $3.99 at CVS doesn’t mean the entire contents has to end up on your stoop. Less is more and you can save what is leftover for next year, what a bargain! This is an appropriate use of spiderwebs; nice, very “Grey Gardens.” They are stretched out across a large area and partially obscure the plants and gate. Here’s another great one! I’m not usually a fan of the brightly colored spiderwebs but I like the effect they have created by mixing it with the classic white. The proportionally sized spider lurking in its web is an excellent touch. Very spooky! OK… if you don’t have the kind of architecture that the synthetic webs will adhere to, like smooth, rounded railings, then you really shouldn’t force it. The use of painter’s tape to secure the webs subtracts from the creepy effects that they can potentially create. 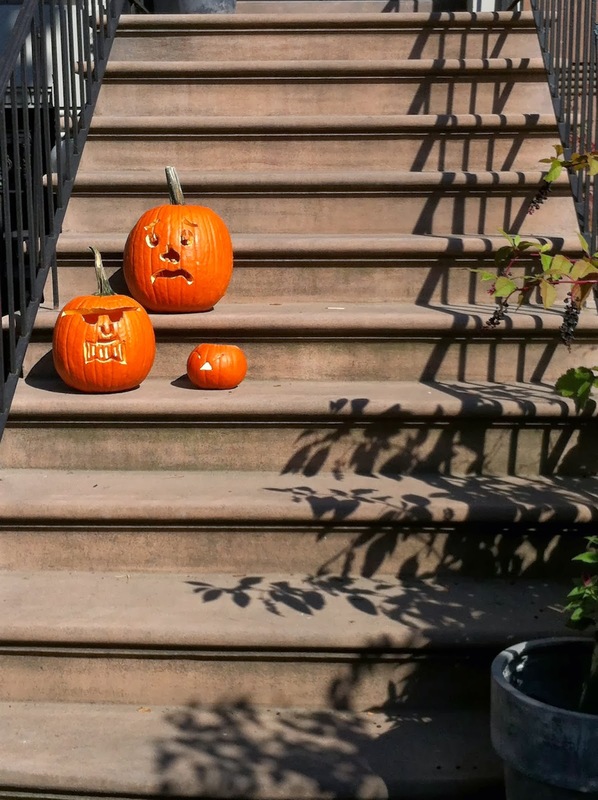 How about a couple of nice pumpkins instead? I’ve also seen some fun “candy corn” fairy lights that could work well here. Sadly, the Halloween cotton candy machine has exploded, no sweet treats for the kiddies at this house! But seriously, I think some people don’t understand the concept of how the webs are supposed to work… or they just can’t commit the time to install them properly. It does take patience! Again, Halloween garlands or some gourds may be a better choice if this is your situation. Let’s end the spiderwebs chapter on a high note! Thanks to Dayna Bealy for sharing this picture with me. 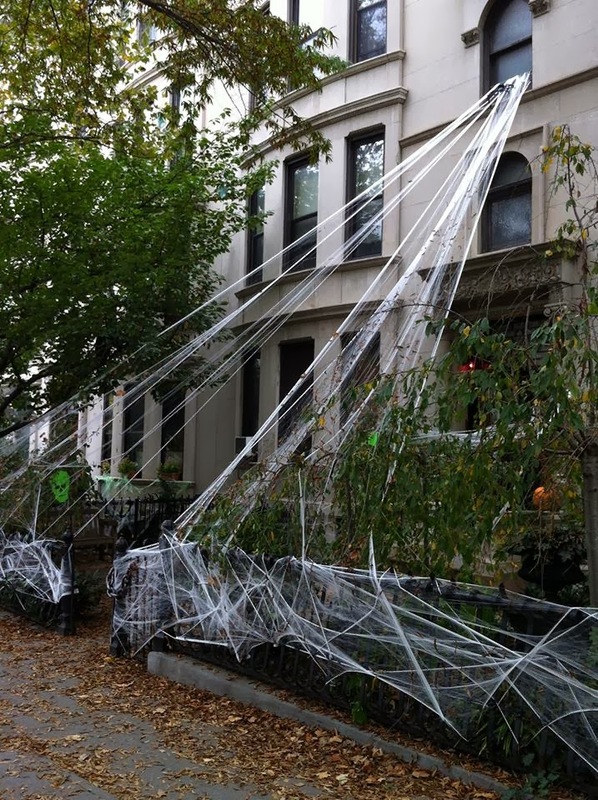 This is probably the best use of the webs I’ve seen this year. 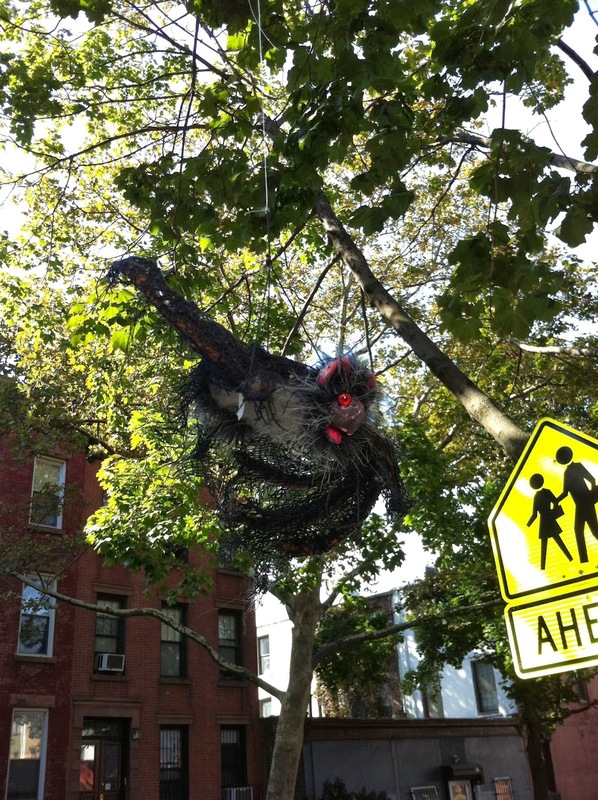 Compared to the first example, they are really stretching their webs for a realistic and creepy effect. I like how they surround visitors to this building, changing the experience of entering and exiting. Now we can move on to more general decorations. I wanted to clear the spiderwebs, so to speak, before posting the rest of my findings, which are pretty great! Who doesn’t love the traditional Halloween Jack-o-Lantern? This trio will be a welcoming sight for the Trick-or-Treaters next week. Here’s a scary Halloween surprise! This rabid bat was hanging on its own from a long string tied to a tree in front of a decorated home. 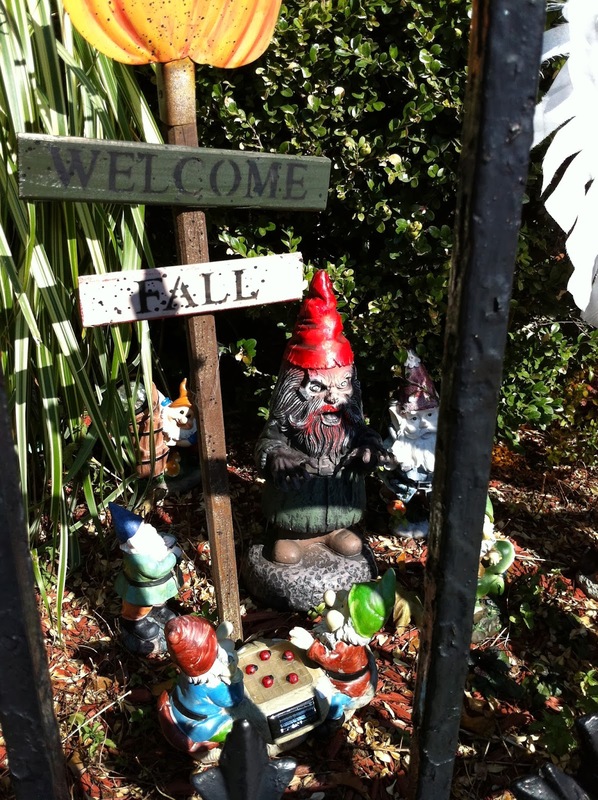 I love how the Zombie Death Gnome contrasts with the “Welcome Fall” sign and the happier, frolicking gnomes around him. 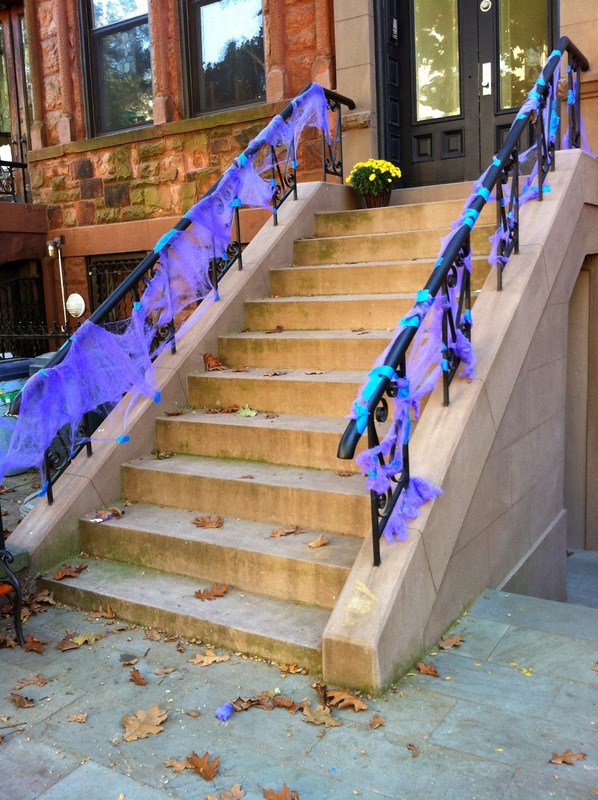 Did Martha Stewart move to Park Slope?! 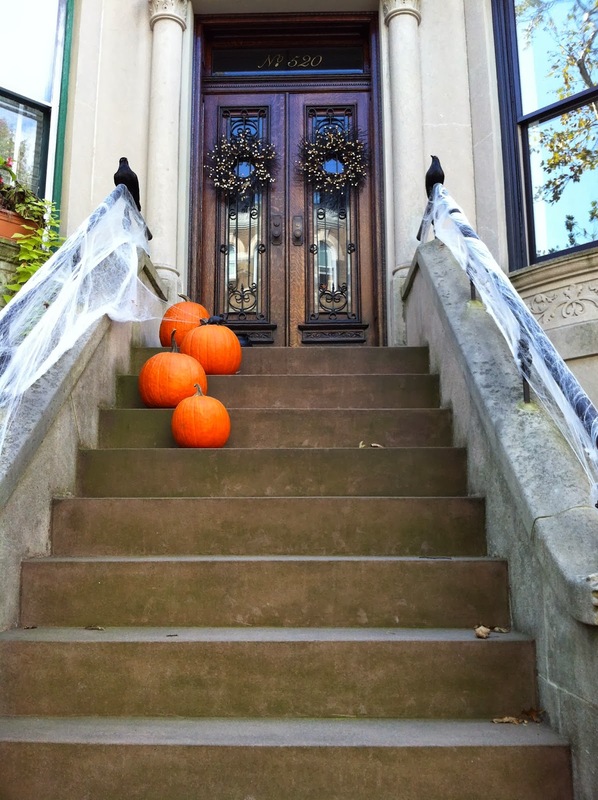 This classy and spooky set up screams “Martha!” to me, who is a fellow Halloweenagin. I especially admire the use of the crows. High marks! I like this, simple yet spooky. 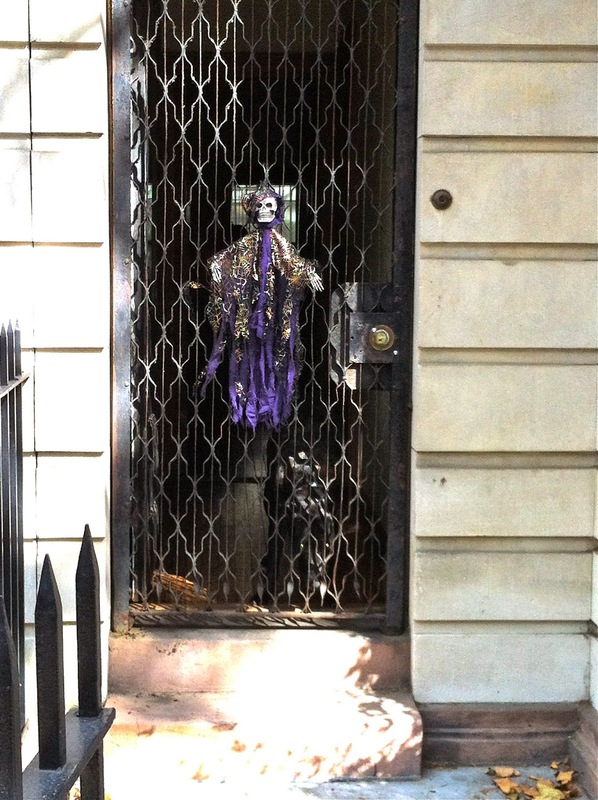 You don’t need much to enhance an already scary entryway. Bonus points for the real, live guard dog inside the door on the lower right. I am sorry that it is so hard to see the pup, it was a very dark hallway. 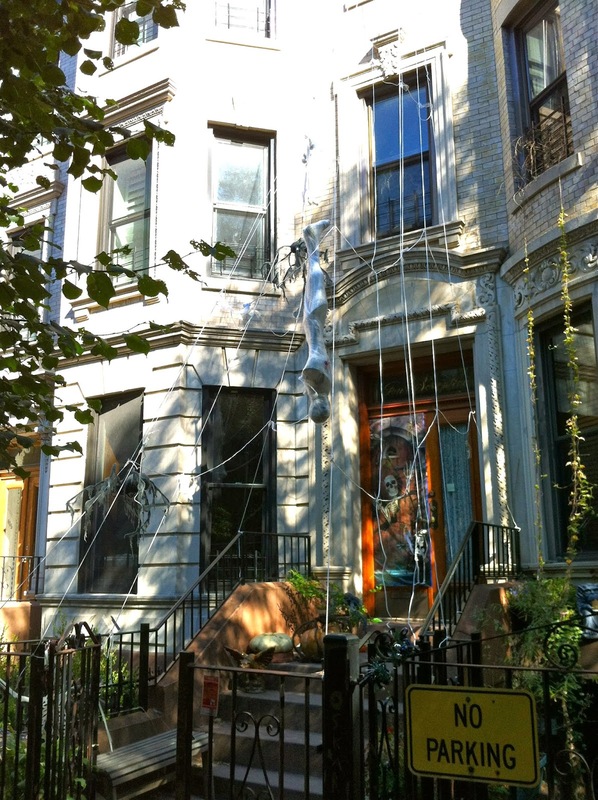 Here are my neighbor’s decorations, they always do a great job with making a 3-story spiderweb out of ropes, plus a cocooned “body,” gargoyles, big spider, and more. I love it! Finally, here’s what I’ve done this year. Beneath the eyes are pumpkin lights which look great at night, but I can’t get a clear picture when it’s dark. I cut the teeth out of an old foam camping mat, attached them to some twine with wire and secured the strand inside my windows. Et voilá, a scary monster face! 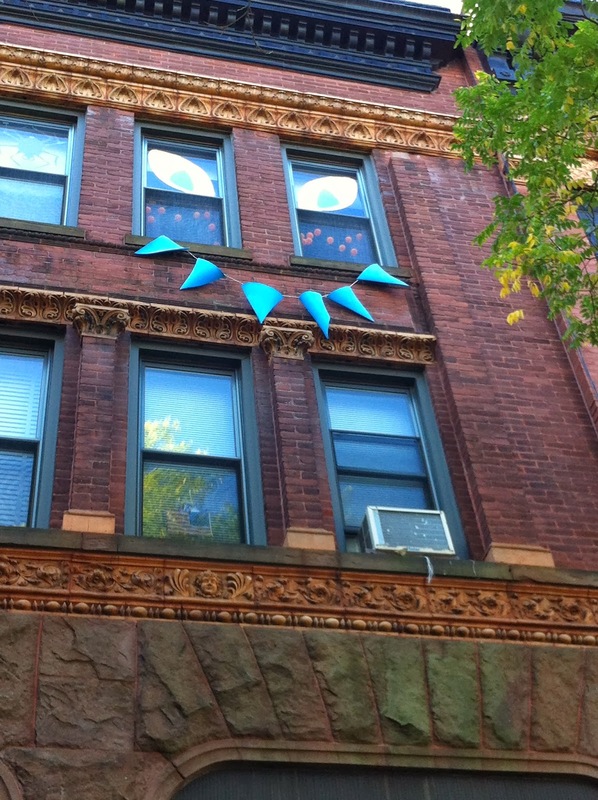 It isn’t very visible, but I also have a large spider cut-out in the far left window. 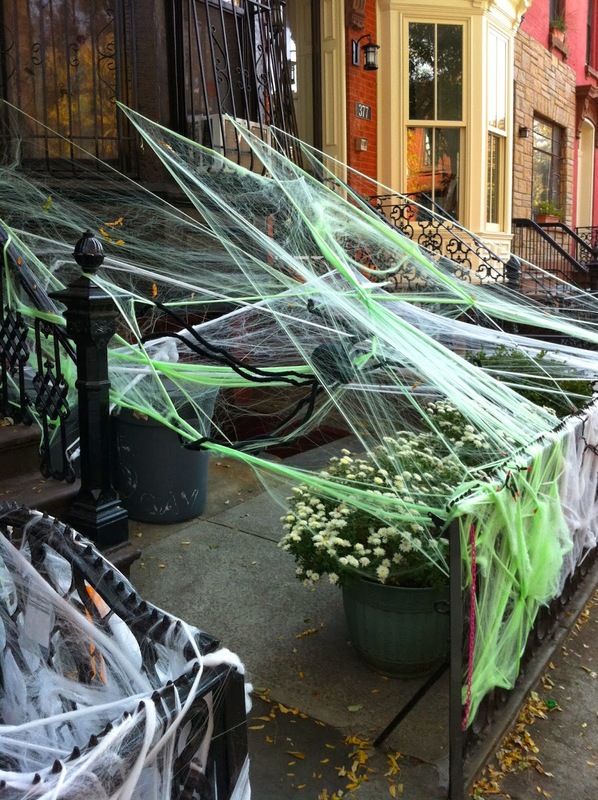 So Happy Halloween, everyone, and let me know if you see any great decorations I should check out or if you need help hanging some spiderwebs!